Respawn released Apex Legends this week, and it’s awesome, you should give it a try. It runs on Source, like Titanfall 2 does. Since it’s a multiplayer only game, there won’t be any unsanctioned modding going on, but I can always do a deep dive into the game and make tools for it. 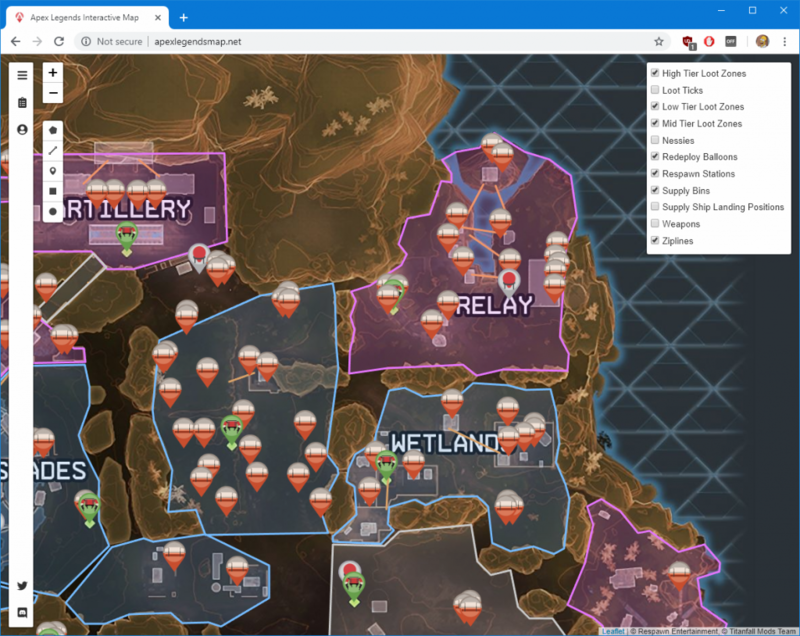 So, I made an online interactive map, you can find it over at ApexLegendsMap.net, or apex.lol for a shorter url. It shows the locations of a load of points of interest for games current map, Kings Canyon. You can see the locations of every loot bin, loot tick, floor weapon, ziplines, and more. I’ve also marked the rough locations of nearly every named zone in the game, along with their most common loot tier. I’ve got a few more things to add to the map still, and with the “battle pass” launching in March it should be interesting to see what Respawn have planned for the game, and see if I need to add anything to it. I’m loving Apex so far, and so long as I’m playing it I’ll try keeping the map up to date.